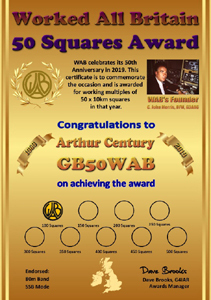 This award is issued for working multiples of 50 W.A.B. squares during 2019. A certificate will be issued for the first 50 squares and endorsements for each subsequent 50. 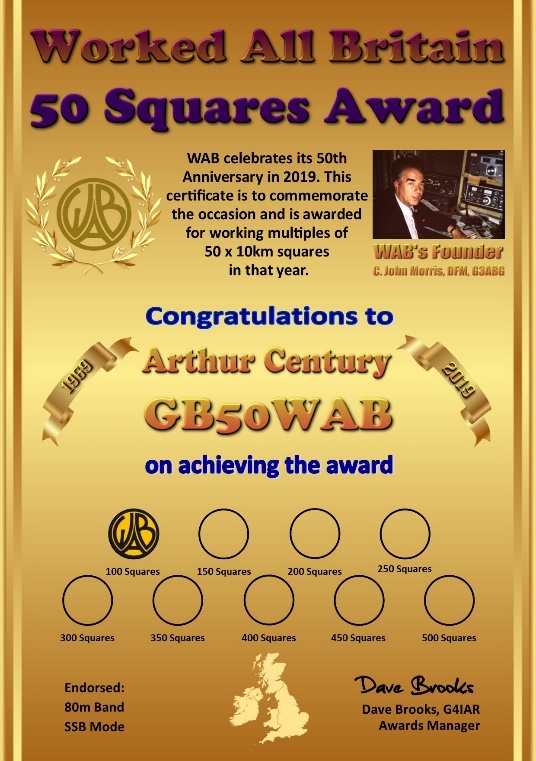 A further certificate will be issued for multiples of 500 Squares. An Excel Tracker spreadsheet has been produced, which can be downloaded from the link below. Full instructions are included in the Tracker, but in essence the tabs have user defined band/mode endorsements and columns for dates. Thus, whilst the logging may at first glance seem a chore, all that is required for each contact is simply entering the callsign and the date. All totalling is done automatically for you.